Dallas Stars – After missing the playoffs last season, the Stars made a couple of moves in the off-season to get back in to the playoff mix. The additions of Patrick Sharp, Johnny Oduya, and Antti Niemi in the crease were supposed to help, but nobody expected this kind of improvement. 54 points in 35 games (26-7-2) is tops in the league, which gives them an eight point edge in the division over second place St. Louis, and a twelve point cushion over Los Angeles for the top seed in the Western Conference. 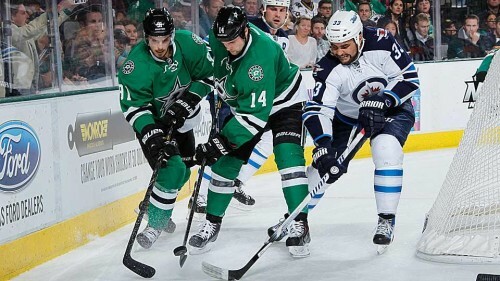 Tyler Seguin (19 goals/27 assists) & Jamie Benn (22 goals/24 assists) are at the top of their games, Defenseman John Klingberg (5 goals/27 assists) is on his way to elite defenseman status if he continues to play this way, and Jason Spezza (13 goals/12 assists) has had a solid campaign, too. Washington Capitals – The Capitals hearts were broken by the New York Rangers in overtime in Game Seven of last year’s Eastern Conference Semifinals, but they certainly haven’t been licking their wounds since then. Their 52 points (25-6-2) puts them right behind the aforementioned Stars for best record in the league. They’re eight points ahead of the Rangers in the Metropolitan, and nine points ahead of Montreal for the top spot in the East. Alexander Ovechkin (17 goals/13 assists) and Nicklas Backstrom (10 goals/21 assists) have provided their usual level of production, and the additions of TJ Oshie (13 goals/9 assists) and Justin Williams (10 goals/13 assists) have given the Caps the second tier scoring they’ve been lacking. The biggest reason for Washington’s surge to the top of the conference has been the play of Goalie Braden Holtby (21-4-1 / 1.96 GAA / .931 save percentage), who is the clear front-runner for the Vezina and should get some heavy Hart conversation as well. Florida Panthers – Coming in to the 2015-16 campaign, the Panthers were considered a second tier team in the Atlantic Division. They weren’t expected to keep up with the likes of Montreal, Tampa Bay and Detroit, but maybe be in the Wild Card conversation. The start to their season was mediocre, but apparently turkey is their equivalent of Popeye’s spinach. Since Thanksgiving, they’ve won eleven of fourteen and will look to extend a five game winning streak when play resumes. They’re only one point behind the Canadiens for the top spot in the division. Jaromir Jagr is their leading scorer (10 goals/15 assists), but they’re also getting solid secondary contributions from all over the roster. Roberto Luongo has been rock solid between the Panther pipes, posting a 14-11-3 record with a 2.21 GAA and a .925 save percentage. Anaheim Ducks – The Anaheim Ducks were one of the top favorites to not only win the West, but to potentially win their first Stanley Cup since 2007. Instead of jockeying for the division lead (in a very average division) with their crosstown rival Kings (20-11-2), the Ducks find themselves in the muck at the bottom of the pond (12-15-6). Not only are they in last place in the Pacific Division, but they are at the bottom of the West, and only one point ahead of the Columbus Blue Jackets (more on them in a bit) for the league’s worst record. Corey Perry is producing (11 goals/10 assists), but they need more from Ryan Getzlaf (19 assists, but only one goal) and their supporting cast. Goaltending has been a major issue since it’s been a revolving door this season. John Gibson has looked sharp, but has battled injuries on and off. Frederik Andersen, who was a reliable crease presence during last year’s playoff run, seems to have lost his way (5-8-4 / 2.59GAA / .911 save percentage). 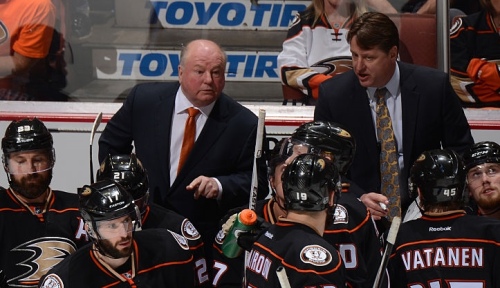 I’m surprised that Bruce Boudreau hasn’t been canned, and he probably should have been weeks ago to shake things up. Columbus Blue Jackets – After a horrendous start to the season (eight straight losses, 2-10 in October), Columbus fired Todd Richards and brought in John Tortorella to right the ship. Things started to get better in November, but an injury to workhorse goaltender Sergei Bobrovsky has brought the Blue Jackets back to doldrums. They have the league’s worst record at 13-20-3, and it doesn’t appear that they’ll be climbing out of the league’s bottom tier any time soon. It’s also never a good sign when your head coach and the team’s top player and franchise cornerstone (Ryan Johansen) are at odds. GM Jarmo Kekalainen may be forced to move Johansen, but that would be a major step back for an organization who made the playoffs two seasons ago, and was given the benefit of the doubt with a strong finish to an injury riddled season in 2014-15. Pittsburgh Penguins – The addition of Phil Kessel this past off-season was finally supposed to give either Sidney Crosby or Evgeni Malkin the goal scoring winger to put them over the top. Kessel’s production has been good, but not great (11 goals/9 assists), and Malkin is doing his part (17 goals/15 assists), but Sidney (who is currently out with a lower body injury) has only scored six times to go along with sixteen assists. Pittsburgh fired Mike Johnston last week, and is giving Mike Sullivan an opportunity to get the Penguins going again. Instead of battling among the top teams in the Metropolitan Division, they find themselves in sixth place (16-14-3), two points behind their cross-state rivals in Philadelphia, and four points ahead of the lowly Hurricanes. Getting puck-moving Defenseman Kris Letang back soon will help, but Pittsburgh needs to put together a string of victories soon before they fall too far behind. *The Calgary Flames avoided the naughty list with an 8-2-0 record thus far in December. Montreal’s strong start to the season kept them off the naughty list despite their horrid performance in December (2-9-0).